A project description I wrote for the GBD Architects website and their 2017 IIDA submission; the project won the Oregon Design Excellence Award - Corporate. 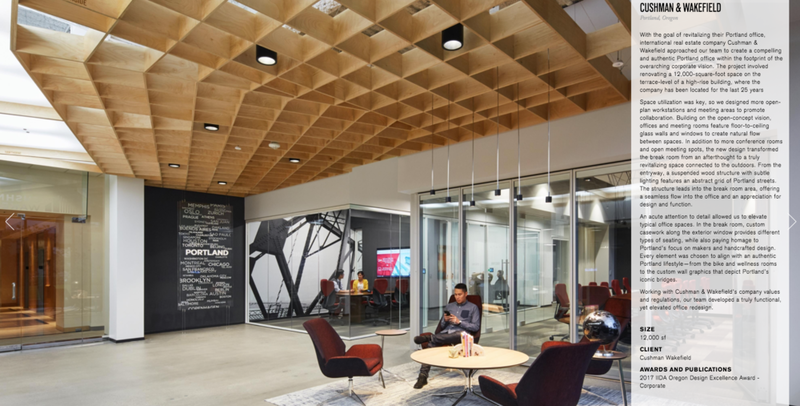 With the goal of revitalizing their Portland office, international real estate company Cushman & Wakefield approached our team to create a compelling and authentic Portland office within the footprint of the overarching corporate vision. The project involved renovating a 12,000-square-foot space on the terrace-level of a high-rise building, where the company has been located for the last 25 years.